If you run a business website or even a personal website then we would recommend that you purchase some good web hosting for your site. If however you are just starting out and learning how to use WordPress then maybe you should consider using a free hosting company? You can learn the ropes for things like installing WordPress, adding themes and plugins and maybe even learning how to do some web coding. 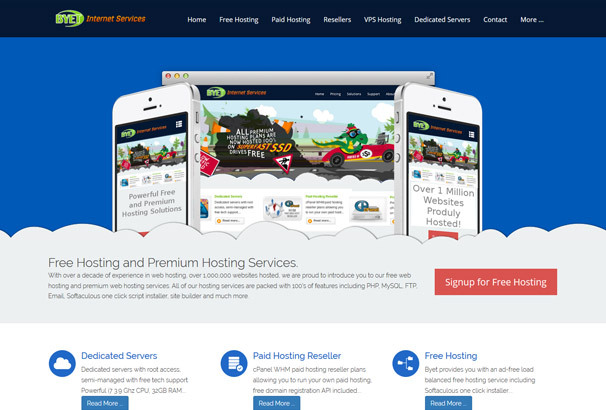 There are a number of free hosting companies which allow you to signup and create your own WordPress website completely free and some of them offer an experience that is on par with paid hosts. Of course because you are starting out on a free host, there is nothing stopping you from upgrading to paid hosting later on. One thing we should note is that you should invest in your own domain name, if you use a hosts sub domain as your site address and want to change it later it becomes more of a pain and you could lose any search engine traffic or links you have gained. If you use your own domain from the start, it’s vert easy to move your website and keep all your hard-earned traffic. We have scoured the internet, reading reviews and have put together this list of 12 companies which offer WordPress hosting with no forced advertising, text links or annoying popups. Take a look below where we have added a description of each and also listed the specifications which are included with each host. Because they are all free you can signup with as many as you like and test them out till you find one that suits you. WPNode is a free WordPress hosting provider with a good reputation, it is 100% free of charge to signup and create your website and there are no advertisements placed on your site. They provide an emphasis on speed and security and they even include customer support should you need it. As well as WordPress hosting they also offer other CMS hosting such as Joomla, Drupal and Magento so most popular options are covered. The easy to use control panel which you do not have to learn before start blogging. 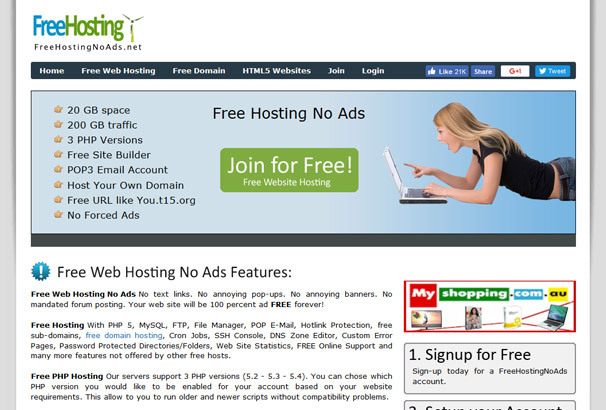 Free Hosting No Ads are somewhat of a veteran in this space, having been established in 2010 and catering to thousands of users over the years. They offer free hosting for WordPress websites with no advertisements and they also offer hosting for Joomla, Drupal, phpBB and other open source Content Management Systems. They offer the chance to win free domain names if you like their facebook page where they regularly give away domains to members of their 23,000 member strong page. Number of templates along with the tools like Joomla, phpBB, and of course, WordPress. Host your own domain or use Free URL like You.t15.org. There are 3 PHP versions are provided by this company, which you can choose as per your website requirements. The website will be online for the time period of your choice. The freehostingnoads.net does not disturb you with the upgrading of your website. ByetHost are another company which has stood the test of time, being established for over a decade and hosting a remarkable 1 million websites in that time. They offer hosting with generous features and limits and they also offer you the chance to upgrade to paid hosting should you outgrow their free offering. GB of the disk space. It gets you the tech support for free of cost. Control panel for your easy handling of the website. 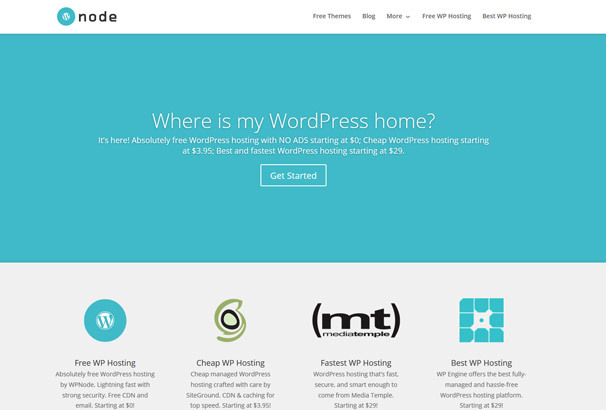 Free WordPress hosting no ads & no popups. 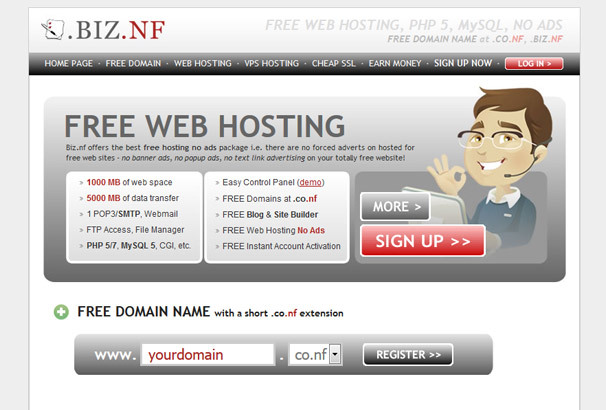 Biz.nf are a hosting company which offers free hosting plans with 1000MB of diskspace and 5GB of bandwidth per month. Their free offering has no forced adverts or popups or even text links and they also offer more paid plans should you require them which start out at just $4.95 per month and allow you to host 2 domains. Free hosting for WordPress no ads. 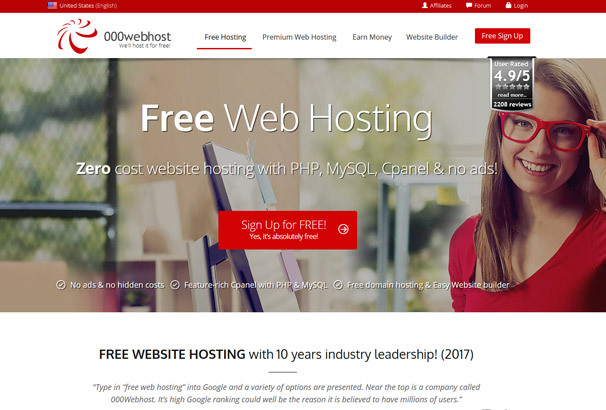 000webhost.com have been hosting free websites for 10 years and have even been mentioned on Forbes magazine as one of the top free hosts. They have catered to millions of customers over the years and offer a solid free package which includes PHP, mySQL, Curl, Zend, IonCube Loader, htaccess and more. They do not include advertising on any of their customer’s websites and they also offer paid plans if your site grows in future and you need more resources for it. 10 GB (10,000 MB) of bandwidth! 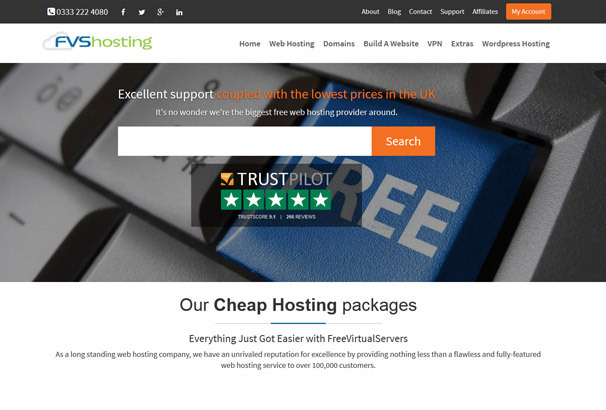 Free Virtual Servers are another well established hosting company with a solid online reputation for quality. They include cPanel with their free plans which gives you access to a powerful control panel and full control over your website. 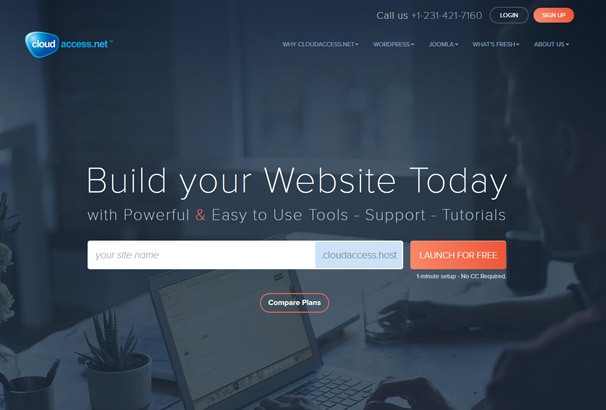 cPanel also includes one-click installers for a range of software including WordPress. Their free plan includes 1GB of bandwidth per month which should be enough for most starter sites and if you find that you outgrow that, you can upgrade to their paid plan which included 10GB per month for just £1.67 per month, that’s really good value compared to most other hosting companies price points. Cloud Access is a compny born out of “Open Source Values” who offer a surprising amount for free. If you decide to signup with them you will get access to a basic Cloud Control Panel(CCP) which includes advanced features such as one-click Site Replicator and App Snapshot tools. They also include daily backups for free to make sure your website is safe from any problems that might arise. You can choose from either WordPress or Joomla and host it for free, if you require other features which are not included such as the ability to use your own domain ( the free plan includes a sub-domain ) then you will need to opt for a paid plan which starts at $5 per month. It’s a shame that the free plan doesn’t let you use your own domain but you could use this company as a chance to learn the ropes with WordPress and get familar with using it before choosing to upgrade to a paid plan. 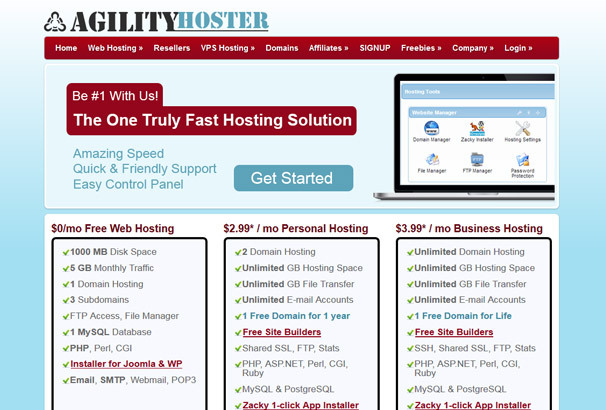 Agility Hoster offers free hosting for WordPress or Joomla as well as paid plans starting at $2.99 per month. They have built their own infrastructure for providing a solid shared hosting platform which includes 5GB of bandwidth for free, ability to use your own domain and 3 subdomains, 1 mySQL database and a 1-click installer for WP or Joomla. All of their plans come with customer support and a 99.9% uptime guarantee. 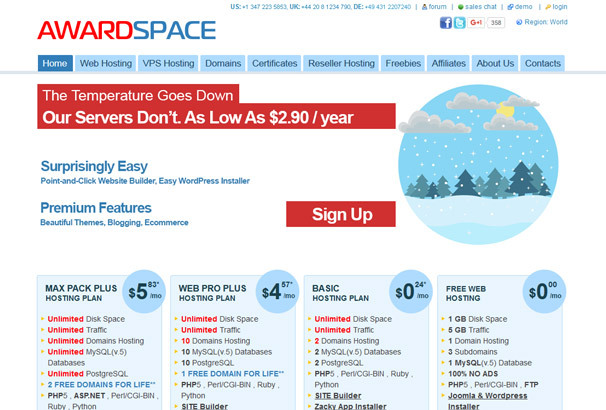 Award Space are a large hosting company with a free plan which includes 5GB traffic and 1GB diskspace alongside their paid plans which start at just 14 cents per month! Free plans also get access to a free domain in the .dx.am registry so they are perfect for small hobby sites who do not have any budget and will allow you to get a website up and running for no cost at all. 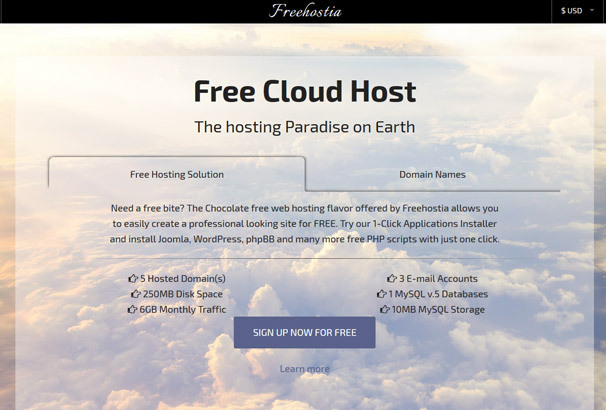 Freehostia are a cloud hosting company which will let you signup for a free account and install Joomla, WordPress, phpBB and many more free PHP scripts with just one click. Their hosting uses a load-balanced cluster platform which is up to 15 times faster than the widespread one-server solution that most free hosts use. Their free plan has generous limits including 6GB of monthly traffic and you can use it to host up to 5 domains on one account. 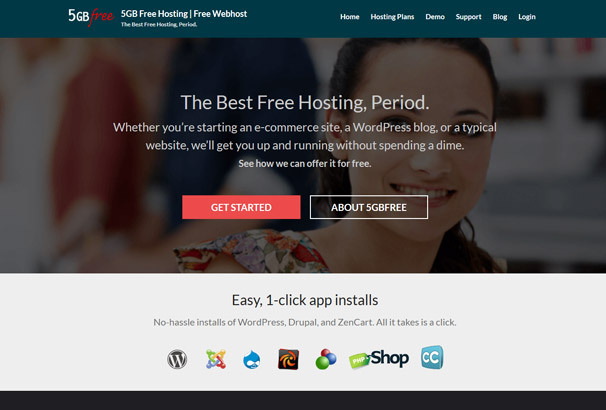 5GB Free are another good company which place no adverts on your site and offer a range of 1-click app installations of popular software including WordPress. They give you access to your very own cPanel installations which allows you to create databases, email addresses, FTP accounts and so on like you would get with a paid hosting plan. Customer support is even offered via the use of their support forums. 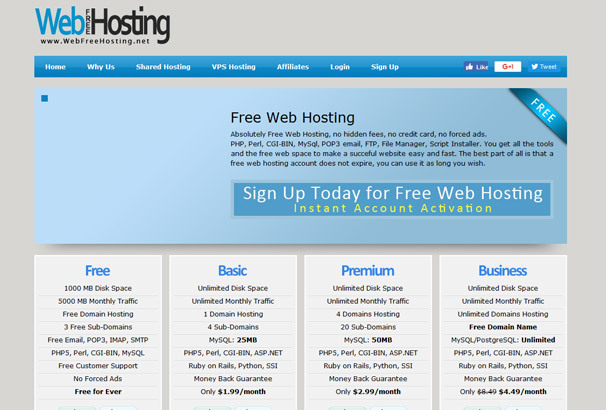 Free Web Hosting are a basic hosting provider which offer free and paid plans, on their free plans you are guaranteed to have no adverts forced on your site and you get generous limits in disk space and bandwidth as well as PHP, Perl, CGI-BIN, MySql, POP3 email, FTP, File Manager, and a Script Installer. The hosting never expires so you are free to create your account and use it it until you reach the disk or traffic limits at which point you could choose to upgrade to a paid plan which start from just $1.99 per month for unlimited space and bandwidth.